DupScout Server and DupScout Enterprise provide the ability to automatically detect all servers and NAS storage devices on the network, search duplicate files in hundreds of servers and/or NAS storage devices via the network, submit duplicate files search reports to the reports database and display charts showing the number of duplicate files and the amount of duplicate disk space per user across the entire enterprise. 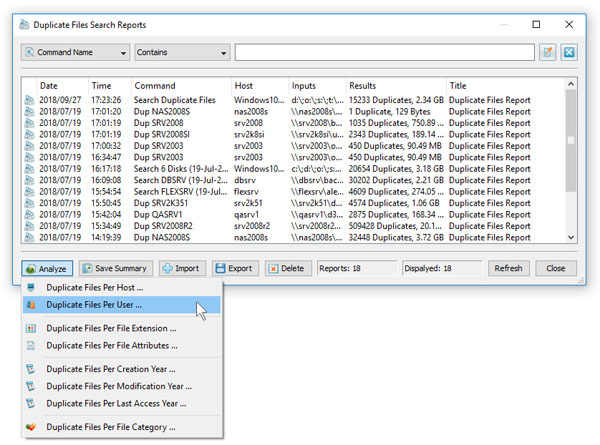 In order to analyze duplicate files per user, perform one or more duplicate files search operations on multiple servers and/or NAS storage devices, open the 'Reports' dialog, press the 'Analyze' button and select the 'Duplicate Files Per User' menu item. 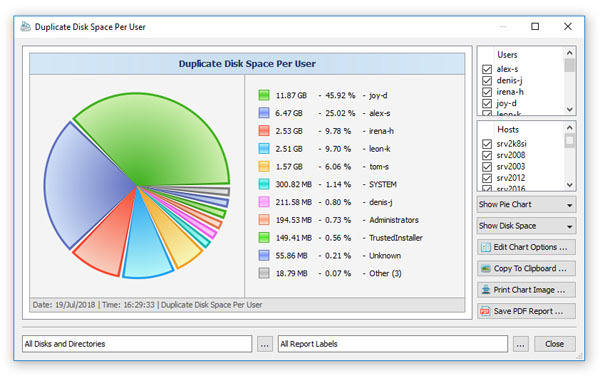 DupScout will analyze all reports saved in the reports database and display the users analysis dialog showing the number of duplicate files and the amount of duplicate disk space per user. The users analysis dialog provides the ability to display pie charts and bars charts showing the number of duplicate files per user according to duplicate files search reports saved in the reports database. The user is provided with the ability to select the types of duplicate files search operations and file system locations to analyze, edit the chart header and footer, copy the chart image to the clipboard and export graphical PDF reports including pie charts.